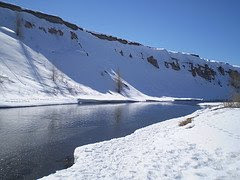 Colorado River Spring Fishing Weekend! 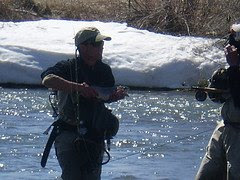 We were able to hit the Colorado many of the last few weekends before the Rado turned Chocolate. 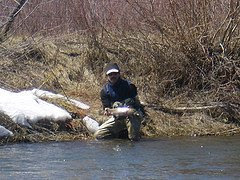 It's been fishing great for most of late March through mid April hitting a few near the Parshall area...checkout some shots! A nice Colorful Bow I got on the Bluey! 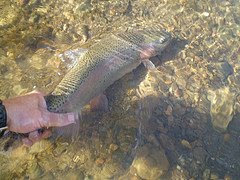 Man do they get colorful in these parts, reminds me of a few San Juan Rainbows or even a few from the Yampa up the road. Sweet Day of fishing! I had this spot all to myself before the fellas made there way up to Grand county on Friday. 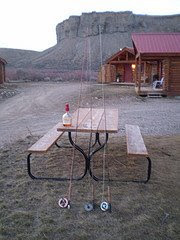 Ahhh Winter fishing in the Rockies is pretty hard to beat! Well hiking in was a bit challenging but we made it in know time. Dave with one of his Nicest Bows of the Trip! 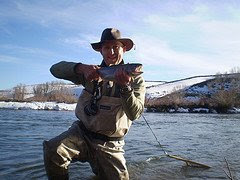 He beat his previous years record for his biggest trout caught on another fine trip. Basecamp Cabins in Kremmling was the spot to be in. 5 minutes to the water, a few blocks to anything we need and fine Mexican restaurants to chow down on. A definite must for our next trip, just call and ask for Kim....she'll set you up. *Our buddy Steve made the trip for the day and though he was keeping busy with his fishing dog Sushi, we sorta got split up, that and his dog was keen on a few fishing spots just South of us. He did get into some fish we just missed out on some of his pictures....we promise next time to to get him on here!